I’ve had three days off work in a row this week. I cold have used my time wisely, crossed some things off the little long to do list in my head, but alas that hasn’t happened. I’ve been a bit lazy. In fact, I’ve been very lazy… and I feel crap for it. 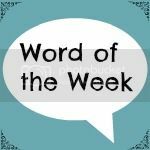 So my word of the week has to be lazy. There is so much I could have been doing. I have a mental to-do list the length of my arm, it would have been sensible to try and cross some of the things off the list. Instead, I’ve sat around on my bum, thinking about the things I could be doing rather than actually doing them. Sometimes I think I just shouldn’t sit down in the morning, because when I do the rest of the day is doomed to be rubbish. I take the kids to the school bus at 8.30. Some days I come back and start doing things, and these are generally productive days. Other days I decide to reward myself with a wee coffee,you know, to reward myself for making it out of bed that morning. After the cuppa comes the TV show I have recorded on sky, and then something else comes up. All the while my wet washing sits in the machine from the night before, the breakfast bowls still sit on the kitchen table waiting to be cleared away. I add the tasks to my mental to-do list. Days like that are OK on the odd occasion. Sunday morning maybe. Certainly not three days in a row when you really have other things to be getting on with. I only have myself to blame though, I haven’t been getting to bed until 1.30 most nights this week, and I’m stumbling out of bed at 6.30 each morning wondering if you can get coffee administered by drip. I feel annoyed at myself, thinking of all the things I could have done. All of the time I’ve had. So I’m declaring this week a bit of a write off. It’s ok though, next week is a new week and I can start fresh. I’m going to write some of my to-do list down on to paper instead of storing it on random post-it notes floating around my head. It’s so much easier to get things done when you have a physical list in front of you. I hope you have all had a more productive week than I have…. Enjoy your weekend my lovelies! There's probably a reason why you have done it though and probably not a 100% down to being lazy. There is nothing wrong with it, so don't be too hard on yourself and we all do need to take some time for ourselves and just do nothing and relax. We can't always be rushing about to complete our lists. I have a never ending to do list but I are sure I ignored it yesterday and treated myself to a me day. Its important to have them, funnily enough i blogged about it yesterday. My plan was to do it to day but that went out the window as other bits (nothing productive) got in the way. If you feel bad it's good motivation to kick in and do bits but don't be too hard, you probably needed the rest too. It is good to have a me day now and then, I think three days in the row is a bit too much though! I think it has given me a wee bit of motivation to get more done next week, but you are right I probably needed the rest. Lazy days are ok, maybe it's your body and mind telling you to rest up, the rest of the world can wait. I suppose you are right, although I don't feel rested because I spent most of the time thinking about what I was meant to be doing. Silly really! Oh sometimes it's okay to be lazy, especially when you're working. Yes, definitely okay to have those as my husband would say "bugger all" days once in awhile 😉 #wotw. There is something so motivating about seeing what you need to do on paper. I think it's because it's a physical reminder, which means it can be crossed off after and you can feel like you have achieved something. Ahh Lazy days are ok! Sometimes we need them….I hope next week is more productive for you! It is definitely the late nights. I never learn though, it's currently 11.30pm and I'm sitting up blogging when I said I was going to have an early one! If my sofa wasn't so comfortable maybe I wouldn't sit down for so long! I have to write lists of my to do things, or they won't get done. Next week is a new week and armed with your written to do list, I'm sure you'll be very productive. Sometimes we need time out and there's no harm in that. This happens to me ALL the time. You are not alone!! Hi Lauren, how I start my day tends to reflect on the rest of the day too…Like now for instance. I woke up bright and breezy and full of intentions of doing the things I need to catch up on. It's now 13.15, I am still in my PJ's and haven't even thought about dinner. The dogs are looking at me for a walk, Hubby Dearest suggested a bike ride and I have laundry baskets full of dirty laundry. Nothing wrong with being lazy every now and again, but I had a 'day off' (I wish) yesterday. So on that note I am closing my laptop and heading to the shower, before the rest of the day gets wasted!